Look at that cover! Two blue people with a sword, woman against man violence, what ten-year-old boy wouldn’t like that? Cover by Joe Madureira. That expression: Heads – You lose! Has stuck with me all of these years. To the point where I always call Head whenever I get the chance to call the coin flip. If I win it, I get to say, Heads, You Lose. It makes me smile, but I probably come off like a jerk. Which makes me edgy and cool, so really, I get to win twice. Which is nice. This is a reprint of Uncanny X-Men 177 by Chris Claremont and John Romita Jr. You really can‘t ask for a better opening to a story. Mystique is running around a carnival and straight up killing X-Men, one on one style. This was the era where you could conceivably kill Wolverine by cutting his throat. Mystique comes up with some great ways to kill the X-Men. First Wolverine, then Kitty Pryde goes down, after checking on who she thought was Wolverine. Mystique guts Kitty and this angers Colossus beyond belief (as it should!). He chases her into a Funhouse Mirror room and one of Cyclops’ optic blasts kills Colossus and then Mystique strangles him. Which I find to be unfair. Mystique adopts this cool looking wetsuit and uses it to blow up Storm via a gas tank. Then Rogue shows up and Mystique blasters her with a gun. 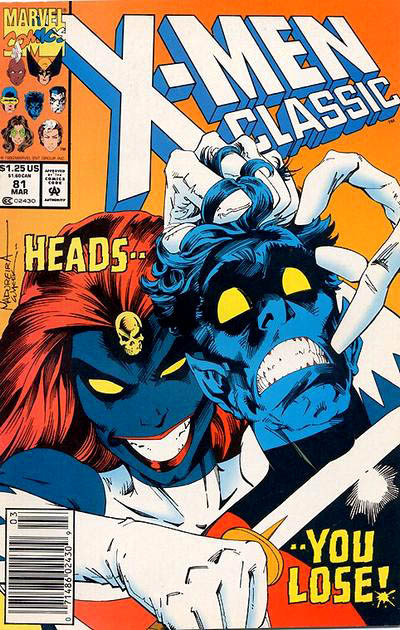 At this point, we know that Mystique raised Rogue for a time, but they are still only hinting that there is a relationship between Mystique and Kurt. She prepares herself to stab him but can’t and he knocks her out. Turns out, this entire exercise is due to Arcade and Mystique is a willing participant in Murderworld. Sort of like Taskmaster’s training academy, Arcade rents out his Murderwold to fellow villains, so that they can practice their skills. You have to make a living somehow, and those two figured out the easiest way to do so. All Arcade wants, as well as payment, is to make sure one of the robot X-Men is set to kill, whereas the rest are only set on stun. Rogue was the killer this round. Kitty is dancing with at Stevei’s studio, about to open up about Storm’s new look, 80s Storm, when Storm shows up and ruins the mood. Lilandra and Corsair say their goodbyes. Then we move along to the conclusion of the issue. Double date city! Kurt and Amanda are out with Colossus and Kitty. They are going to see a ballet. Amanda and Kurt make a joke about Colossus and Kitty parking the car. While on the way back to the ballet, Pyro and Blob start fighting Colossus. He actually holds his own for a while. Pyro turns Colossus red hot, then Avalanche destroys these two semis that are holding liquid nitrogen (making Richard Blais and me pretty happy). Kitty shows back up (after looking for help) to witness a frozen status of Colossus, but sister, that ain’t no statue.